LOS ANGELES, (GaeaTimes.com)- Halloween’s Day is round the corner and the people are getting ready to celebrate the day with maximum excitement. However, menu can be a real subject of concern, as not many people know about the traditional Halloween Treats generally associated with the day. Your Halloween Treats may include the usual Candy apples, Candy corn, candy pumpkins, Caramel apples, Caramel corn and Colcannon. Colcannon is an Irish dish made of kale or cabbage, mashed potatoes, butter, salt, pepper and leeks, cream, chives, onions, garlic, boiled ham or Irish bacon and milk. 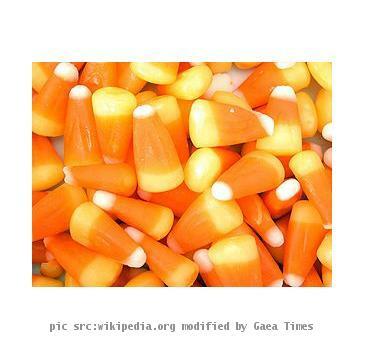 Candy Corn is an American dish made of sugar, corn syrup, water and salt cooked together to form a slurry. Marshmallows and Fondants are then added to it to make it softer. This final mixture is then molded into your desired shapes. Caramel apples or taffy apples are prepared by coating small apples with caramel layers, and heated properly, so that the coat gets smooth and evenly dispersed. The caramel apple Halloween Treats can be more delicious and attractive, if the layer of caramel is adorned with nuts and chocolate chips. If you want to make your Halloween Treats more adventurous, you may prepare a Scottish dish, Rumbledethumps. Where you have to fry onion and cabbage in a butter for sometime and then add some potatoes mashed with butter, salt and pepper. Mix the ingredients, and add cheddar cheese from the top, to bake it for sometime until it turns golden. To make it more crispy, bread crump may also be added to it. Soul cakes may also be a good option. All you have to do is add fill it with allspice, nutmeg, cinnamon, other sweet spices if available, and raisins and complement it glasses of wine on All Halloween Eve.